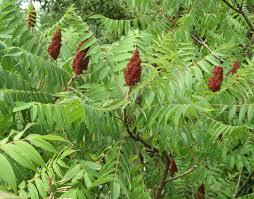 The colony-forming smooth sumac is a 10-20 ft. shrub with short, crooked, leaning trunks. The leaves alternate, with 13–30 sharp-toothed leaflets. On female plants, yellow-green flowers are followed by bright-red, hairy berries in erect, pyramidal clusters which persist throughout winter.